A recent study showed that people with cluttered homes were 77 percent more likely to be overweight or obese. Why? Organisational pro Peter Walsh thinks it's because you can't make your healthiest choices in a disorganised environment. 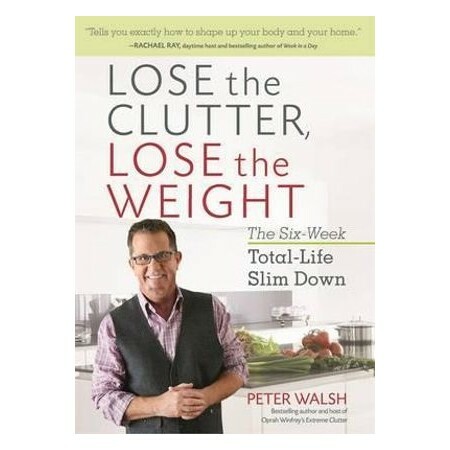 In Lose the Clutter, Lose the Weight, Walsh arms readers with a simple 6-week plan to clear their homes of excess stuff and their bodies of excess pounds. With a dietitian approved eating plan, physiologist-developed exercise program, room-by-room organising guide, quizzes to help readers get to the root of their problems and testimonials from the volunteers who followed this plan and saw great results from significant weight loss to calmer minds and more organised, happy, and efficient lives. Lose the Clutter, Lose the Weight is the only book to help readers clear the clutter and zap the pounds. Peter Walsh is the author of six previous books, including the New York Times bestsellers It's all Too Much and Enough Already! He is a popular organization expert who appears regularly on The Rachael Ray Show and writes a quarterly column for O, the Oprah Magazine. He lives in Los Angeles.